This is a two-part presentation, but I wanted to keep everything in one place. Accordingly, I’ll put links to both audio parts here as they’re released. Because Glider: Being an Account of One Man’s Path to the CFI Certificate by Way of Uncle Ernie’s Holiday Camp, a Couch at a Radio Station, &c.
If you follow me anywhere on social media, you’ll know that I recently completed the Herculean effort of becoming a certified flight instructor (or “CFI”) in the glider category. I first started flying gliders in 2012 when my friend, and later instructor, John Harte, invited me to go fly a motorglider after a haircut that I had scheduled in Detroit one Saturday. By the second time we flew, I was training for the rating. Four months later, I was a commercial glider pilot and, six months later, I flew my first airshows as a performer in the same aircraft. Since then I’ve logged more than 200 hours in motorgliders, more than half of that in formation. 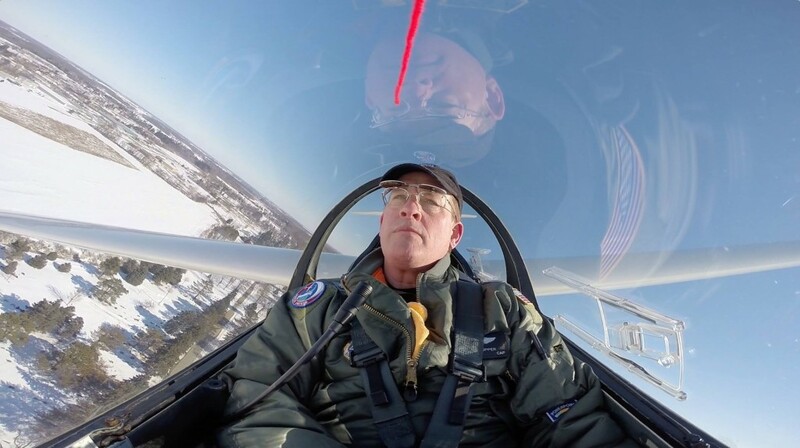 Through the kind efforts of Mark Grant, Chris Felton, and others in the Civil Air Patrol, I even added an aerotow endorsement so that I could fly gliders that had no onboard powerplants. I earned that one after about 20 tows, most of them conducted in Owosso, Michigan in single-digit Fahrenheit temperatures where you had to close the canopy and hold your breath until you had airflow through the window on takeoff so you wouldn’t completely frost the inside of the canopy. If you earn an aerotow endorsement in Michigan in the winter, you have well and truly worked for that endorsement. And then, like the urge of Ishmael to get to sea, I began to feel the urge to do the next big thing. Certainly, there are plenty of challenges that could have been that next big thing. I really ought to add both single- and multi-engine airplanes to my commercial certificate. But a number of things pushed me to go for the CFI. I’m very broad in aviation, but not very deep. Until I started flying gliders, I could fly a lot of stuff, but only with private privileges. I did my glider checkride at the commercial level simply because the practical test standards are about the same for private vs. commercial and the only other requirements are the knowledge test and a more comprehensive oral during the checkride. (Written test and comprehensive oral? Oh, please don’t throw me in that briar patch!) So the idea of taking a single category of flying all the way to CFI appealed to me. I have a son who was getting close to turning 14 at the time. His name is Nicholas, but most of you know him by his callsign, “FOD.” He has about 30 hours bumming around in the TG-7A with me, most of it sitting there in the instructor seat while I fly. 14 is an important age for someone who flies gliders because that’s the age at which you can solo. And it doesn’t matter that the aircraft has an engine and a propeller. If it’s certified in the glider category, you can solo it at 14. I decided that it was not enough to just fly around with him or teach him without having the CFI in my pocket. I wanted to take him to a real CFI for the solo and the checkride. Lastly, I had always thought that instructing would be fun and that I’d become a much better pilot if I did it. During the DC-3 rating, I had the chance to sit in the back and watch somebody else fly under circumstance where I could just watch and think about flying. That was one of the most productive experiences I’ve ever had in flight training. I couldn’t help but think that being able to really observe and critique would make me a much better pilot. So, last spring, I decided to go for the instructor certificate. This is the story of that journey.